The story is about the monumental work of Shaykh Dr Mohammed Akram Nadwi on the female scholars of Islam and how they shaped the Islamic history. His ground-breaking research has so far uncovered biographies of over 8000 female scholar from the time of the Prophet until this century. 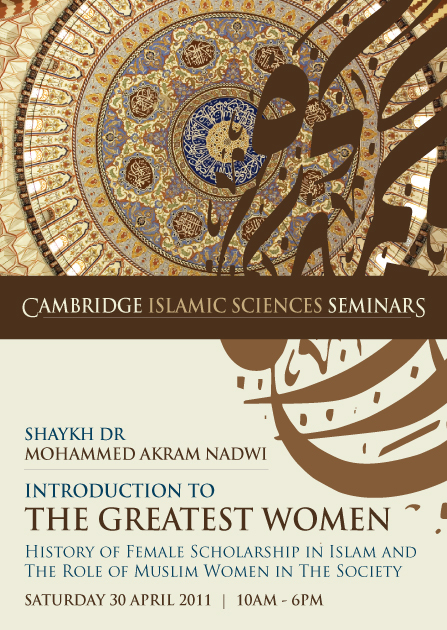 Taking this forward, Muslim Education & Outreach Cambridge is conducting an amazing first-of-its-kind one-day seminar with Dr Mohammed Akram Nadwi on The History of Female Scholarship and The Role of Muslim Women in The Society. The seminar would examine the rich but often neglected legacy of female scholarship in Islam and will highlight the important role they played in shaping history. The seminar will also touch upon how practical lessons can be derived from this history for the modern society.